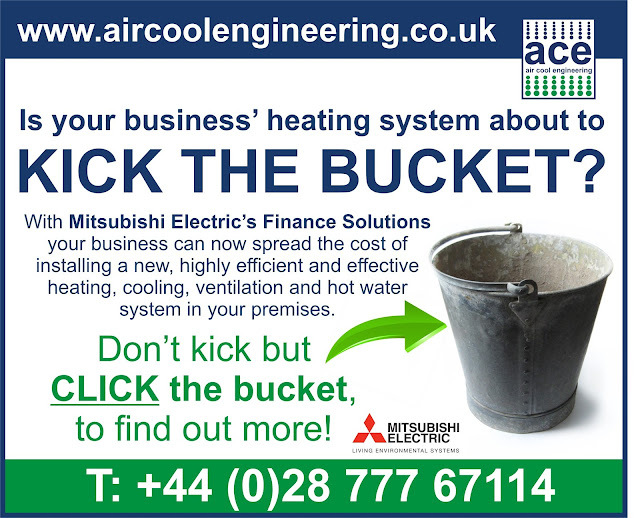 Latest news from air cool engineering (NI) Ltd: Replace and spread the cost of your heating system - before it kicks the bucket! Replace and spread the cost of your heating system - before it kicks the bucket! Is your business' heating system costing a small fortune to run? Is it about to 'kick the bucket'? With Mitsubishi Electric's Finance Solutions, your business can spread the cost (up to 5 years) replacing your existing heating and hot water system, with industry leading, energy efficient and highly effective equipment - that doesn't cost the earth to run! Now really is the time to consider replacing your existing fuel guzzling system! What's so good about Mitsubishi Electric's Finance Solutions? Mitsubishi Electric's five year, “trouble-free” heating, cooling and ventilation Finance Solutions package offers a host of advantages integrating on-site installation and commissioning fees, minimum 7 year warranty on all Mitsubishi Electric equipment and scheduled maintenance visits. Plus, a 24/7 emergency technical helpline is also on hand for any on-site issues. If it's time to replace your business' heating system, call air cool engineering (NI) Ltd on +44(0) 28 777 67114 for a FREE, no obligation site survey and quotation. Alternatively, please visit our purpose built offices in Limavady, to see, touch and hear all our Mitsubishi Electric air conditioning, heating, ventilation and heat pumps in action.